i had a lot of fun making DIY decorations for violet's neon-themed unicorn birthday party. 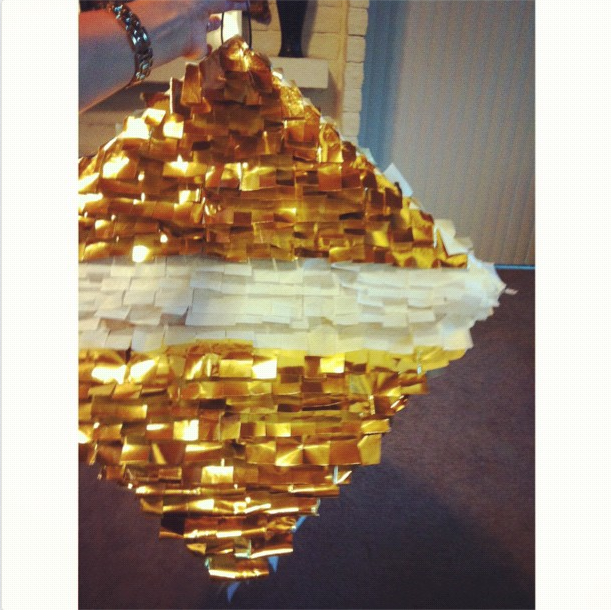 i wanted to share how i made the gold diamond-shaped pinata. hopefully it's helpful to someone. you can really make this any size, color, or shape you want. mine ended up being HUGE but i loved it. until the kiddies smashed it to bits. to hang along with her unicorn pinata. making one large one ended up being easier. but is honestly pretty easy to do. 1. decide on your pinata shape & size. i made a cube, so when hung on a diagonal, it makes a diamond. 2. cut out your cardboard pieces. i cut out 6 squares of equal sizes. attach your cardboard pieces together. this is when i built my cube shape. 4. decide on colors & patterns for your paper. layer & fold your tissue paper or wrapping paper so it will be easy to cut strips. 5. cut long strips, about 2 inches high. or you can add 2 strips together and it won't be noticeable. 5. cut fringes along your paper strips, about 1 inch apart. they don't need to be perfect though, just eyeball it. 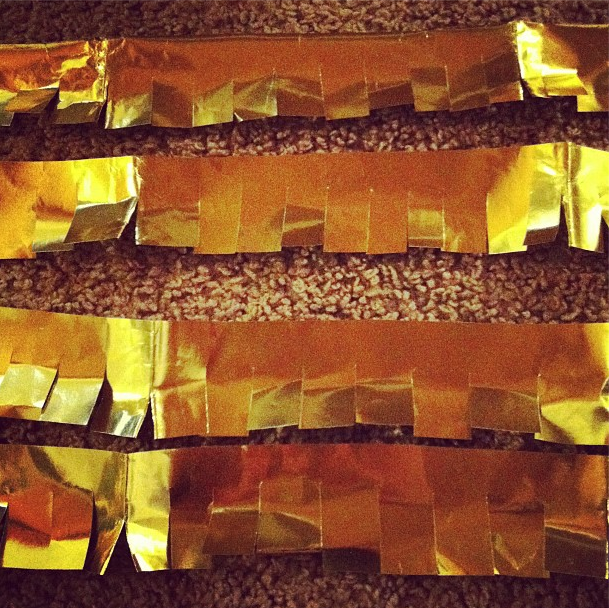 6. lay out your paper strips. ruffle up the fringe so the pieces have some dimension to them. 7. pour some mod podge onto a paper plate. 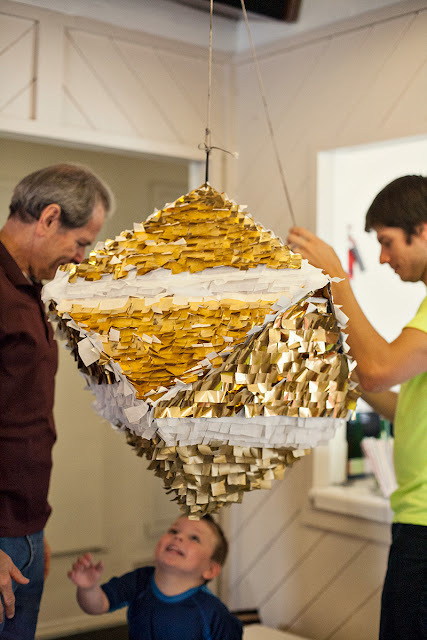 start at the BOTTOM of one of the sides of your pinata. using a paintbrush, brush some mod podge in a line along the cardboard piece. now just stick a paper strip on (being careful not to glue the fringe down). continue gluing strips all the way up to the top of the pinata. just tear a square or two off of the paper strips and glue them down. and reuse the scraps to make new strips. even spare squares look like the fringed strips when you glue them on. after you finish all sides but one, let them dry. after they are dry, you can finish gluing the paper onto the last side. 8. use a cable tie to make a loop so the pinata can hang. cut 2 holes in the top of the pinata, about 1 inch apart. lace the cable tie through the holes and lock it shut. 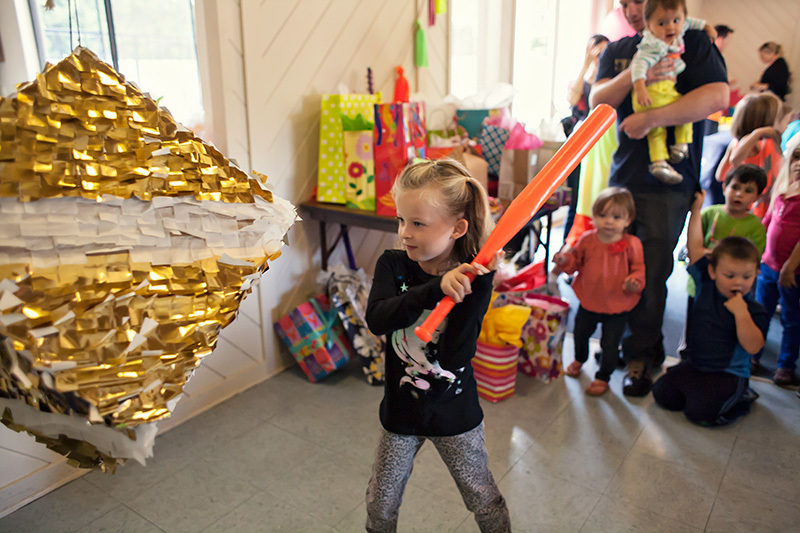 9. use scissors, or an x-acto knife, cut a small flap in the pinata. i cut a square shaped flap with 3 sides. which made it easy to open & close. tuck the tab in before you hang it up. and favors from the dollar store & oriental trading co.
send me a link if you make one! this is seriously amazing, jenn! basically i aspire to be you one day :) happy new year! i am so excited to read about violet's adventures in 2013!! Aw thank you so much!!!! You're too sweet. Happy New Year to you too! Cute idea. It does look like it would be pretty easy! I bet the kids loved the filler toys!